What a week it was! Last week was February Break and it was absolutely glorious. Spending the week with the kids was beyond fun. 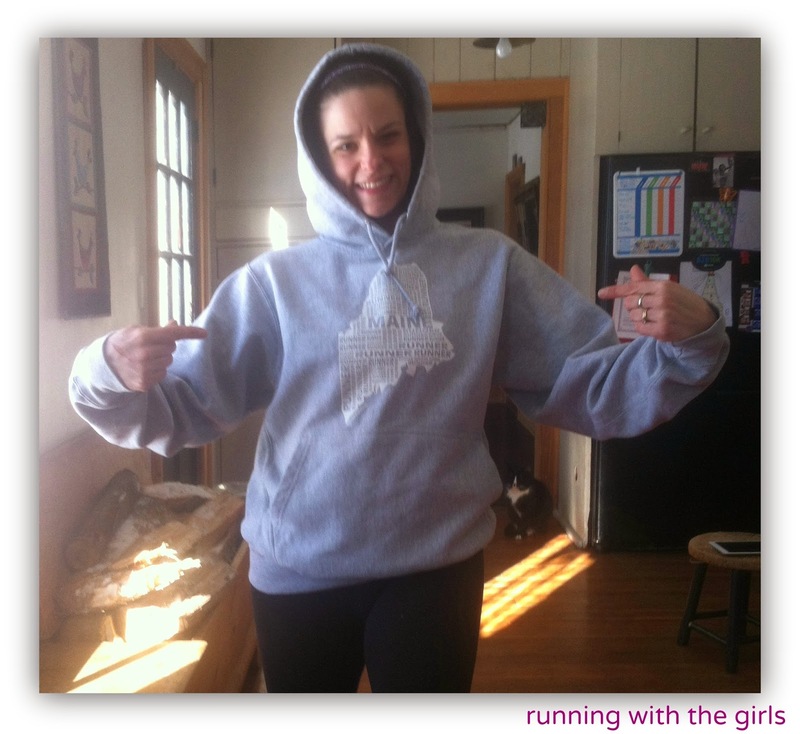 When I wasn't working out or running, I was wearing my newest, most favorite sweatshirt ever. This sweatshirt has been washed roughly 10x already since it came and it's softer than ever and hasn't shrunk a bit. The awesome folks at Gone for a Run sent me this shirt to review. The full review will be up tomorrow! I am very lucky to have kids who, even though they think I'm weird, are always willing to take pictures of me. Love them. My week in review - when I actually took off my sweatshirt. Monday - 5 miles, followed by Jillian Michaels with my girl. I love her choice of clothing for this one. And I love that she enjoys doing dvds with me. I am one lucky momma. I was lucky enough to get to see Ward and the kids when I was out on my run. It was so exciting to see them and Ward was super sweet to stop and take pictures of me. Pepper has been my #1 running buddy this week. Wednesday - 2 snowshoe running miles. We had yet another snowstorm Tuesday night which left us with some super fluffy snow which meant perfect snowshoeing snow. 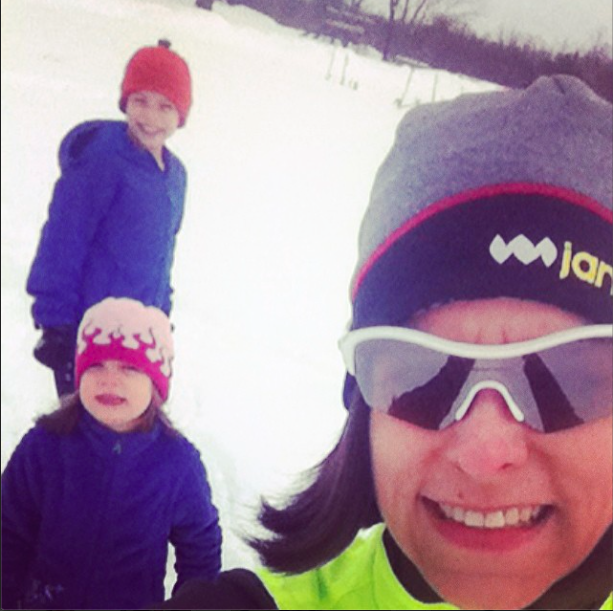 The kids were so excited to put on their snowshoes and head out for a lap around our field to redo my "track". About 3/4 of the way through, I lost them to their favorite tree down in the field, so I headed back to the house, changed up my snowshoes from the wide walkers to our other smaller, narrower ones and headed out with Pepper. The sun came out and it was gorgeous. So I grabbed Pepper's leash and we went out for another 4 mile run. While I was completely covered in mud from Pepper, it was a super fun run. Even my vest had mud on it! When I started out, it was snowing. That beautify heavy wet snow. The snowplow hadn't gone by at that point so I was running down the middle of my road on snow covered roads. I wore my sunglasses to protect my eyes from the snow/ice pelting and it was the smartest decision ever! In the middle of the run it had changed to freezing rain and then just rain at the end. This run just rocked! 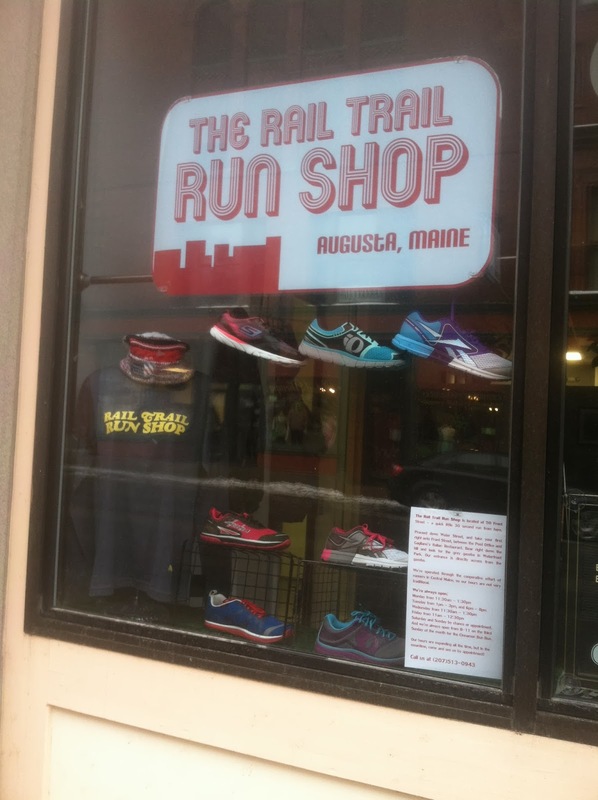 Then I went to meet up with Amy at the Rail Trail Run Shop and we created our first window display. The shop isn't on the main road and we needed potential customers to see what we have and to know how to find us. The smaller poster has the directions. I am loving our display! 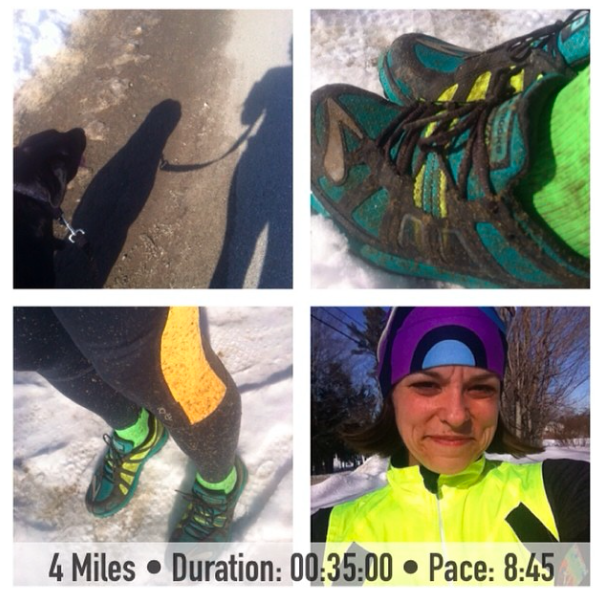 Saturday - 8 GLORIOUS, SUNNY Miles in shorts! The sun was shining, the sky was blue. 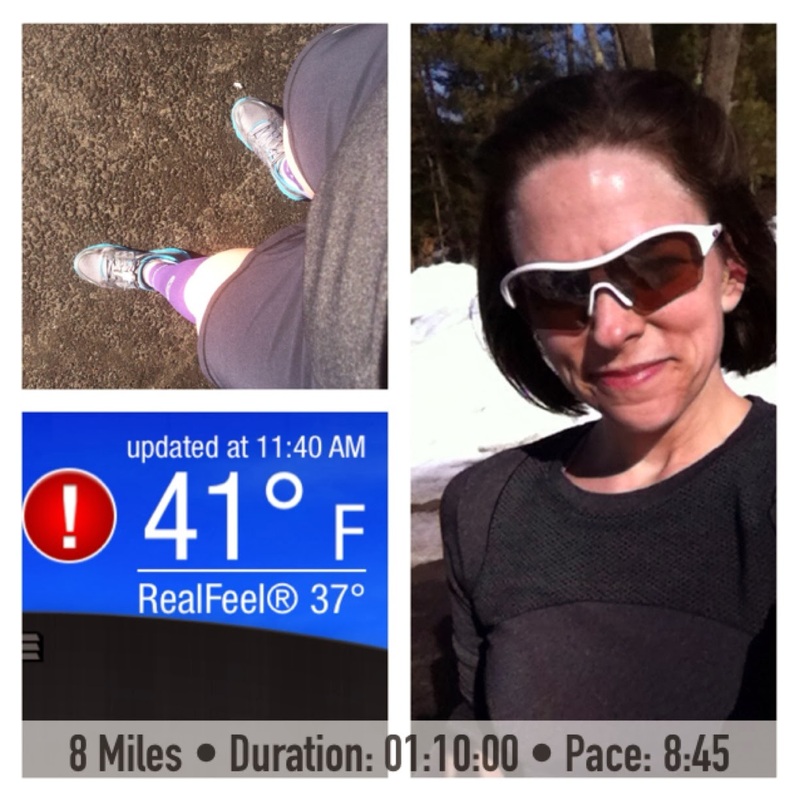 The temperature was above 40F and I had brand new shorts and new Crazy Compression sleeves to try out. I've never worn Pearl Izumi shorts before, but I scored these beauties at the Rail Trail Run Shop on Friday and had to wear them. It was instant love. 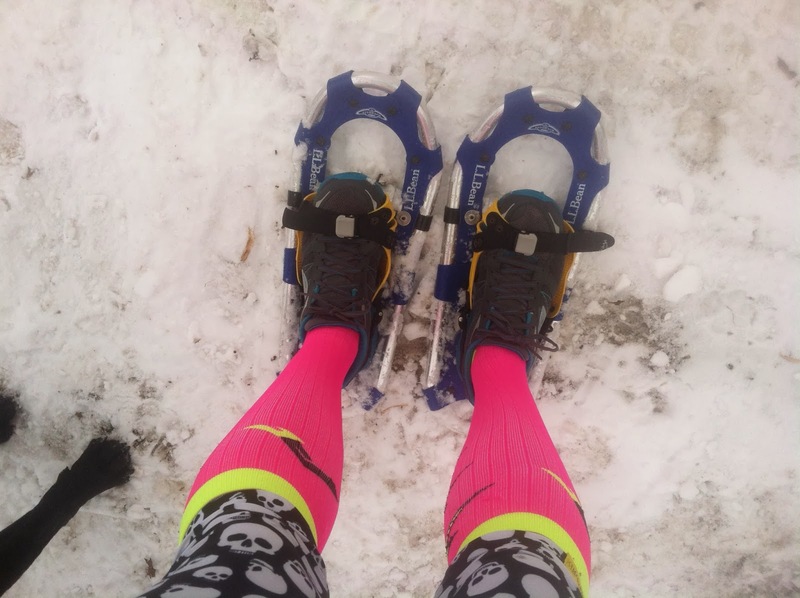 I'd also like to point out those super adorable Crazy Compression sleeves. They had the perfect amount compression and were super comfortable. Sunday - 8.4 miles on the treadmill. It was a nice day outside. A little cloud covered and not as warm as Saturday. But still a nice day. I would have run outside but I was working at the gym anyway from 9-12. On those days it's easier for me to run on the treadmill so I can run as far as I can until 9. Then Ward and I actually snuck away for a movie night. We are awful at setting up date nights. Either he's running or working or I'm running or working. But we made it work! Burpee Total: I'm at 900! Only 100 more to go to meet the challenge which ends this Friday! Psstt... my birthday. Speaking about my birthday, have you checked out my birthday bash virtual race? I'm raising money to fight cancer and have some fabulous prizes to giveaway! Are you the winner of my Apera Sprint bag? Check it out here! The winner has 24 hours to contact me or I'll choose another winner. Happy Monday! so jealous of you getting to run in shorts. I think I have been able to do that only once so far this year. Great job with the burpees! Yay for date night. Sounds like you got in some happy miles this week too! You had a great week there chickie!!! I'm always impressed at how you brave the elements to get it done!! I love all this family friendly fitness!! SO CUTE! Great week! 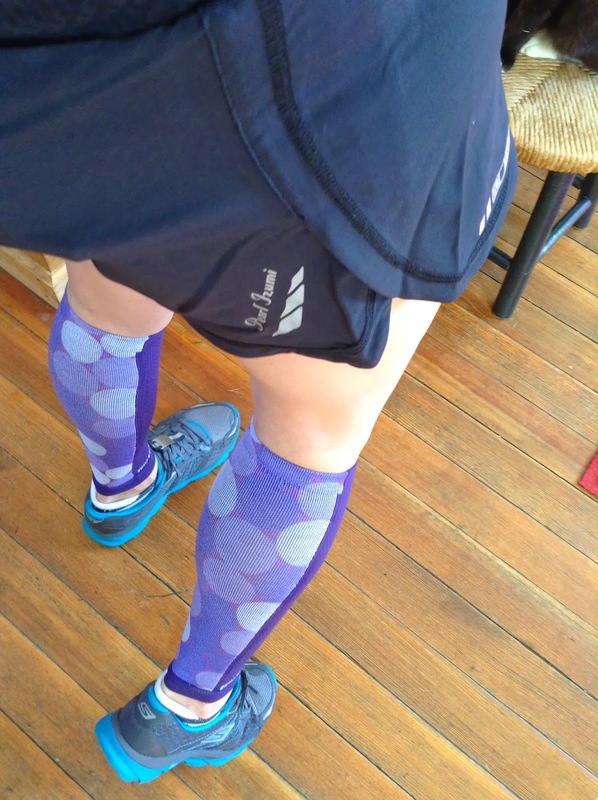 Love the calf sleeves:) My kids definitely think I am weird but are always willing to take pics of me;) Even if they have an annoyed look on their face. 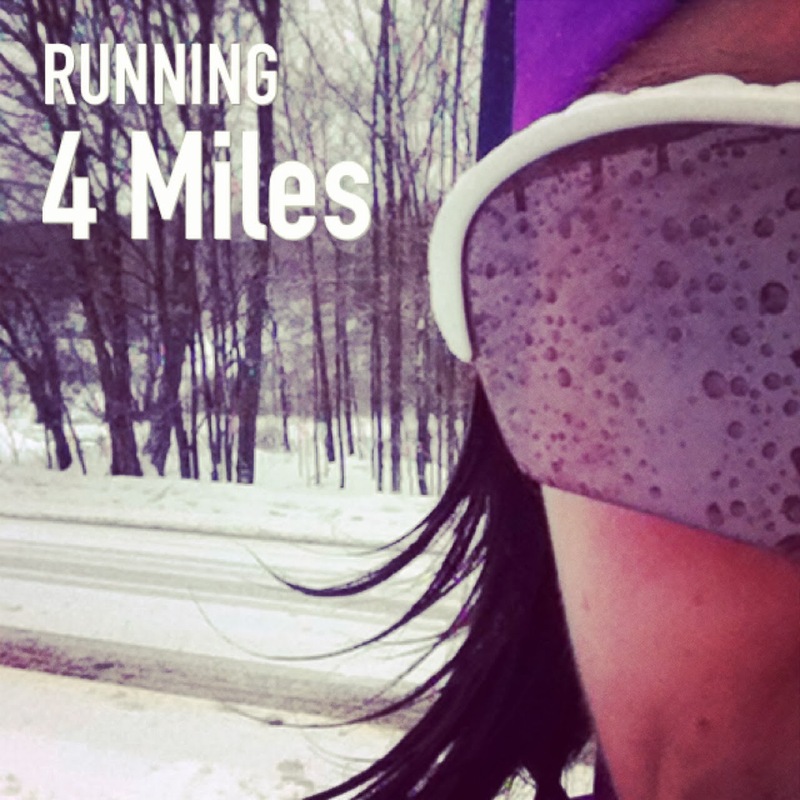 I'm love that you are doing most of your running outside no matter what the weather is. 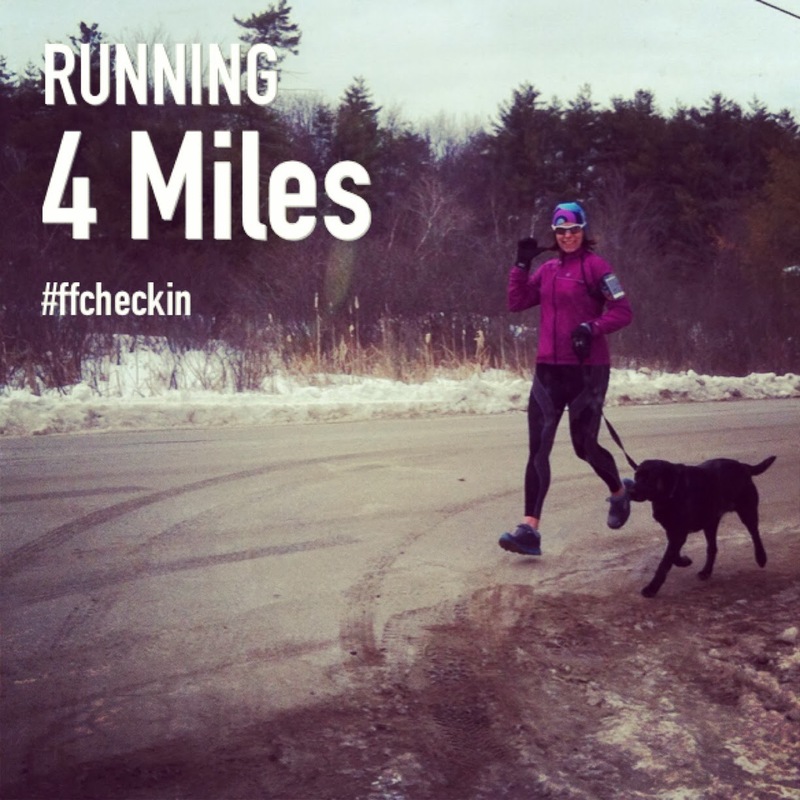 And I love that you are running with your dog too! Great week of workouts! Awesome for always being out!! I loved the weather this weekend. 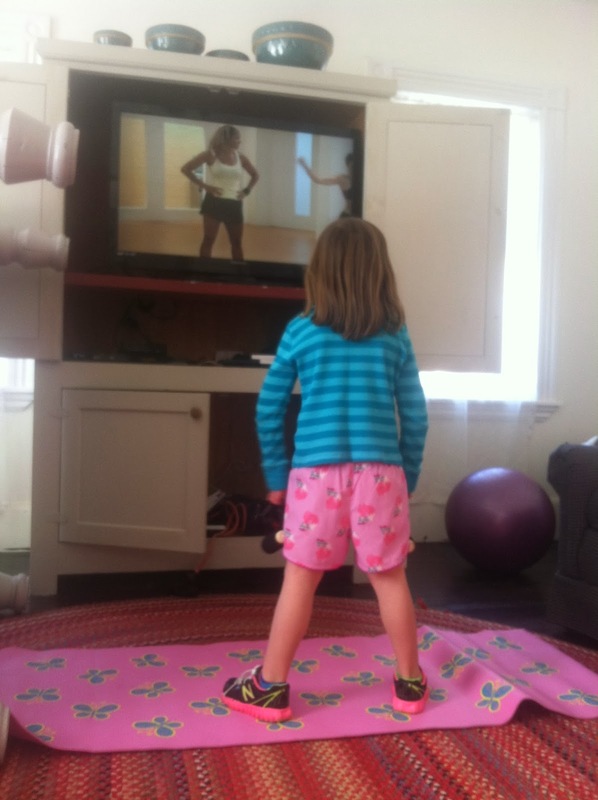 woot way to get out and run it, but seriously the photo of her with the TV is way too cute!! Saturday was so freakin' awesome! Sadly it was just a teaser. Boo! So funny the difference in temperature. 40 is freezing for us here and you are in shorts! Awesome...and I was soooo close to getting you that sweatshirt for your birthday!